More than finally seeing the casino up close was the utter pleasure of meeting the members of the Alexander Hamilton Institute. For many years, we’ve studied the history of Alexander Hamilton, Hamilton College, it’s founder, Samuel Kirkland, and Baron von Steuben. We have visited the campus several times and enjoyed its extensive library (see here and here). My daughter has attended a few of their meetings at their headquarters in Clinton, NY; this was my first time meeting them and I enjoyed it thoroughly. The Alexander Hamilton Institute for the Study of Western Civilization (AHI) promotes rigorous scholarship and vigorous debate in the study of freedom, democracy, and capitalism. 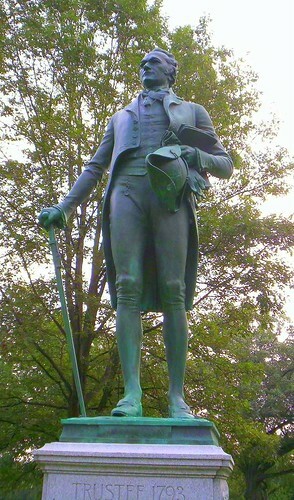 Three Hamilton College professors, Douglas Ambrose, James Bradfield, and Robert Paquette, inspired by the contributions of Alexander Hamilton to the founding and survival of the Republic, established the AHI as an independent entity, unaffiliated with Hamilton College, during the summer of 2007. Inspired by Alexander Hamilton’s life and work, the AHI promotes excellence in scholarship through the study of freedom, democracy, and capitalism as these ideas were developed and institutionalized in the United States and within the larger tradition of Western culture. The word freedom, it should be recalled, had no equivalent in the vocabularies of non-Western civilizations until imported from the West. Democracy first flourished in the poleis or city-states of ancient Greece. While the propensity to truck, barter, and exchange seems to have been inscribed in humanity’s genes, a full-blown capitalist system, one based on the private ownership of the non-personal means of production, originated in England. Since to a great extent modernity implies the momentous extension and elaboration of these ideas around the world, the AHI will necessarily range widely across geographic, cultural, and disciplinary boundaries in pursuit of its mission and to implement plans of rediscovery. I have had a personal affinity for studying the history of our American republic. To see such a group of distinguished people gather together for the same purpose– that of promoting a return to our federalist roots of liberty– is the answer to my prayers. It was so thrilling to talk to people familiar with the Great Awakening, Samuel Kirkland, Charles G. Finney, and Gerrit Smith! This meeting was the first annual colloquium for the newly established Institute. The dinner was sumptuous, the conversation more so. We met other professors and students from Hamilton College, Harvard, and Colgate, who had assembled together to celebrate the Institute and discuss Gerrit Smith. I have been interested in the life and work of Gerrit Smith for many years. I did a short piece on him when I blogged about the Utica Lunatic Asylum here. The children and I hope to go on New York’s “Freedom Trail” from Utica to Auburn. 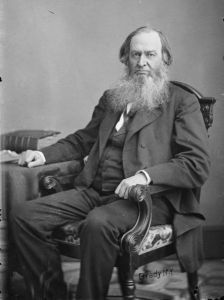 There is just too much to say about Smith, Finney, the abolition movement of New York State that exploded across our country in the mid 1800s, and of the Freedom Trail. It will take me all summer long to write about it! This is something very dear to my heart, as I am a student of New York state history, and, more importantly, a person consumed with a desire to see our nation return to its fundamental roots of liberty and religious revival. My daughter has so often stated that before any great movement of freedom, there was always a Great Awakening preceding. Bob Paquette began the colloquium by noting the utter irony of discussing the life and work of the famed abolitionist and perfectionist Gerrit Smith in a casino. He wryly remarked that if Smith could possibly know what we were doing, he’d be rolling in his grave. This elicited chuckles, and it is true! But we didn’t attend the meeting to gamble. On the contrary, this meeting was only the beginning of a new thing happening all over again! After the heartening speeches of a handful of AHI founders and fellows, John Stauffer of Harvard University (and acclaimed expert on the life of Gerrit Smith) delivered his dissertation. There is just too much to write about it all! It was wonderful. I assume the AHI will post the highlights of the colloquium on their website; I’ll link to it when they do. After the event, my daughter and I got the chance to wander the Turning Stone briefly. I snapped a few photos. 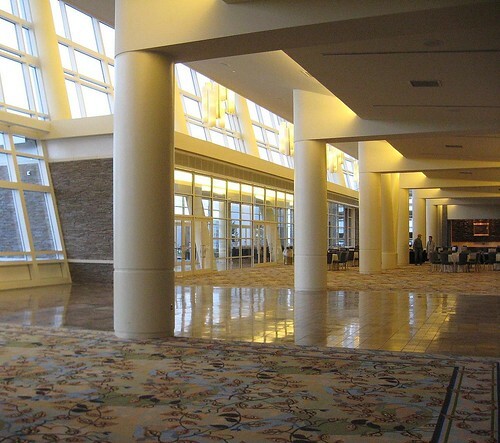 The Turning Stone is a popular meeting place for large conferences. I don’t think there exists any other building for such large events in the area. All the conferences that I’ve ever heard of are held here. Here’s a photo of the building. I’m a poor photographer. The colored “TS” in lights at the top changes colors. 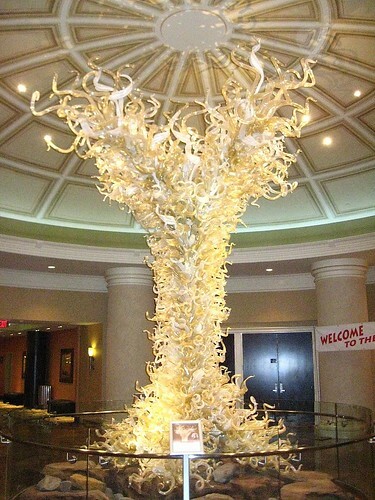 This is the luminous Tree of Peace crafted by Dale Chihuly. 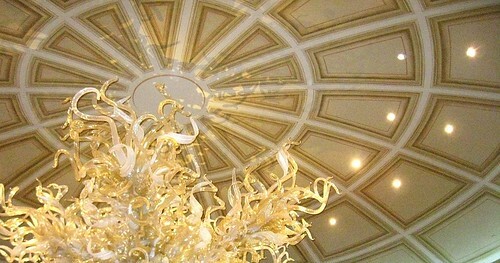 I loved the glass of the lobby as the sun shone in. I took this photo before the meeting. And this I took after. We wandered the halls. 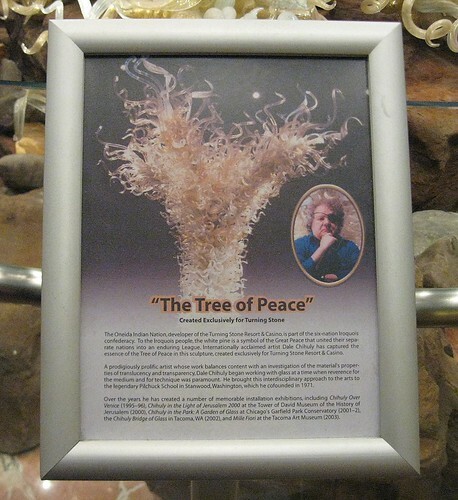 There are many “natural” looking displays in various places. 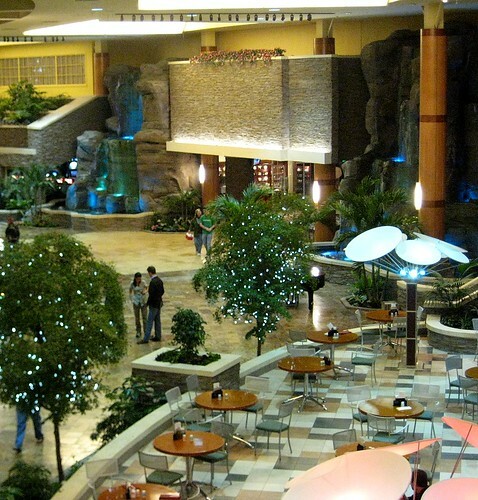 Besides the glass “tree,” there are walls made from cut stone, waterfalls, and earth-tone patterned carpets. 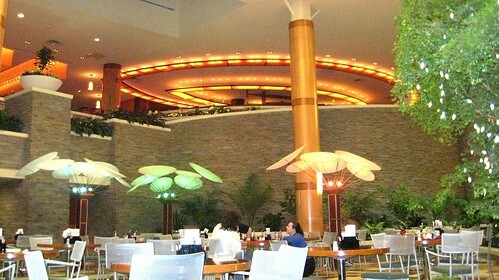 This is a the cafe just outside the gambling rooms. 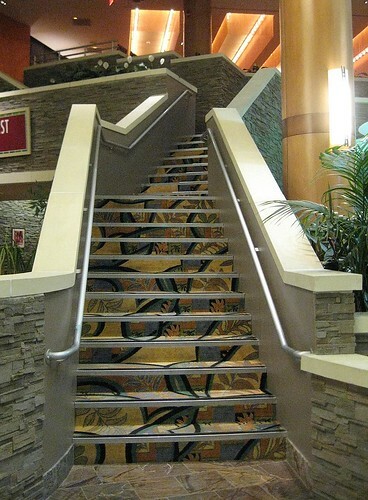 The Turning Stone Casino began as a Bingo Hall, if I remember correctly. 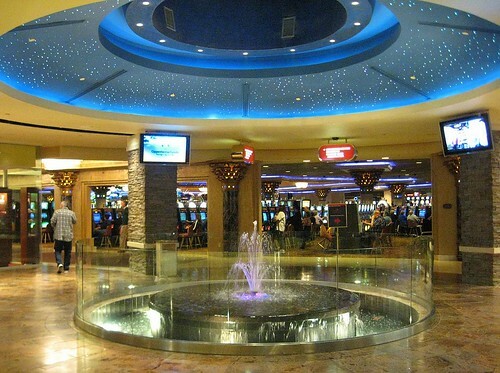 Gambling in New York State is prohibited by our constitution, but through governor-sponsored enactment (Governor Cuomo, in the early 90s), the casino was allowed to open. The Oneida Indian land settlement/casino/resort issues are still in litigation, with some issues going as high as the Supreme Court. The Turning Stone is popular with area residents, however. It is a place where the poor people get to lose all their money. 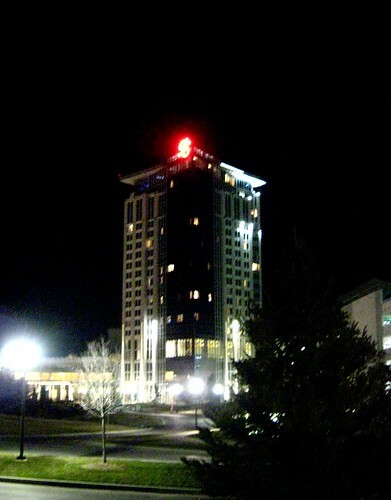 The Turning Stone is Oneida County’s biggest employer, after government jobs. So my guess is that, despite reams of litigation, the casino is here to stay. We visited the Shako:wi Oneida Indian Cultural Center in Oneida, NY. See here for our trip. Ha – the Bingo Hall was one of my 1st projects with Douglas Cardinal Architect. 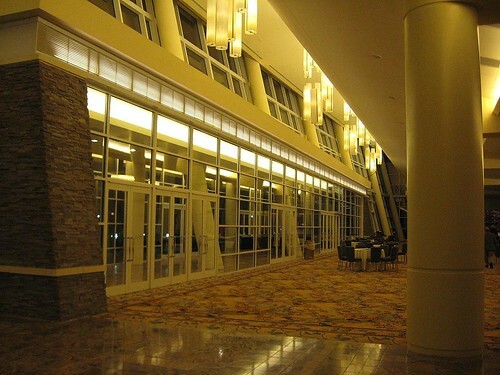 I also worked on the design of the Hotel, Fitness Center and Lobby. I’ll tell Douglas about your blog – he’d like to see these photos. The original bingo hall is a big blue barn out in Oneida. I see it frequently because it’s on the way from the Thruway to my uncle’s house. I believe that it’s now a day care center where elderly community members help care for children–but I only come through there on Thanksgiving so I’m not sure if that’s the case anymore. Often when I’m coming through on my way from Albany to Syracuse or the other way, I hop off the Thruway and fill up at one of the Oneidas’ service stations. They’re completely overhauling the one in Verona that I normally stop at–and I thought it was pretty nice and new to begin with! Laurie, I know which one you mean, because I filled up the tank that night. There were all these construction cones and tape everywhere. The area all around the casino (the country roads) are not lit, and wow was it hairy trying to find my way out of there. 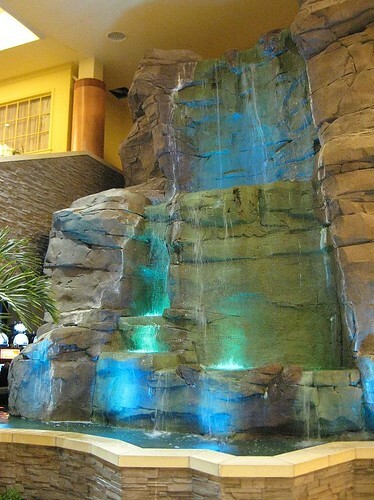 Let’s just say that we got beautiful views of all around the casino and golf course… a few times, lol. But the gas is so expensive, even for the Nation. They have volunteered to have us pay state tax for gas, so it’s $3.40 a gallon! Holy cow! Well, the lecture sure got me interested in learning about Gerrit Smith! It would be great to find his writings, and I can’t wait to visit his old home and the museum. The casino was impressive, to say the least. Ah, I mean the architecture (too bad good architecture and design wasn’t used for a better purpose!). Personally, I think that the Oneidas could use their talent and entrepreneurism for a better and more noble cause, and it’s a shame that the ideas of “religion and virtue” which Kirkland sought to promulgate among them seem to be lost, at least at the resort they are most famous for. We’ll see how long that lasts! I will have to save this link and write a review in the next couple of days. This type of article is always up my alley!